It seems like the holiday season starts earlier and earlier each year (and if we’re judging by how early department stores swap the pumpkins for the string lights and ornaments, it does!) But when it comes to starting to prepare your online store for the holiday shopping season, the earlier the better. This is a HUGE season for the retail world, and it pays (literally) for you to be ready to make the most of it and make some sales! Here are 10 ways to prepare your online store for the holiday shopping season (plus some added tips). Grab some hot cocoa and read on. For Halloween this year, artist Ego Rodriguez got creative with his Artist Shop’s cover photo (above) by decking his usual image out with spider illustrations. Use your Shop’s cover image – both on your homepage and in your collections – to get festive! You don’t have to sacrifice the look of your Shop and your brand; try adding some festive elements to your existing cover photo, or swap it out and replace it with a seasonal/holiday-relevant photo, illustration, etc.! Creating a collection is a great way of directing people to your best designs for the holiday season, whether those be limited-time designs, holiday- or season-specific designs, your best-sellers, or a collection featuring your best designs on the most giftable products. Running a giveaway* is a great way of boosting your follower count. Try making it a requirement that, in order to be eligible for the prize, people must follow you and tag a friend or two. This can build your following and put your work in front of more eyes just in time for the gift-buying season. Order your own products to give away at the base cost with free shipping on orders at least $25 US/$50 international (excludes international wall art & international shoes.). *Be warned! there are rules on every social platform regarding giveaways! Find out more. Being organized is key to having a successful holiday sale season. Plan out exactly when you want to start/end your promos, what kinds of promos you’re running (what percentage off are you going with? Are you promoting free shipping? Is there a code you need to share? ), what assets you need for them, etc. Create a social media calendar for the season for extra organization and to keep track of hashtags to jump on. Have you filled out your About Page yet? Your product descriptions? Added tags to your products? Your meta description? Doing all of these things will make it easier for your audience & niche to find the types of designs you’re offering. It will also make it easier for customers searching in Discover to find your designs, but only if your design titles are SEO-friendly (for example, if you have a black cat design, having “Black Cat” in the title will help direct searchers to your design). Read more about how to use keywords and SEO to your benefit here and here. It pays to team up with someone who has an audience you want to have your designs in front of! Find interesting bloggers, micro-influencers, mega influencers (it’s worth trying!) who might want to collab with you. This can come in many different forms. You can team up on a blog post, ask if they’d be willing to feature your product if you sent it to them for free, perhaps you can team up on an illustration, do an interview with them – get creative with it! 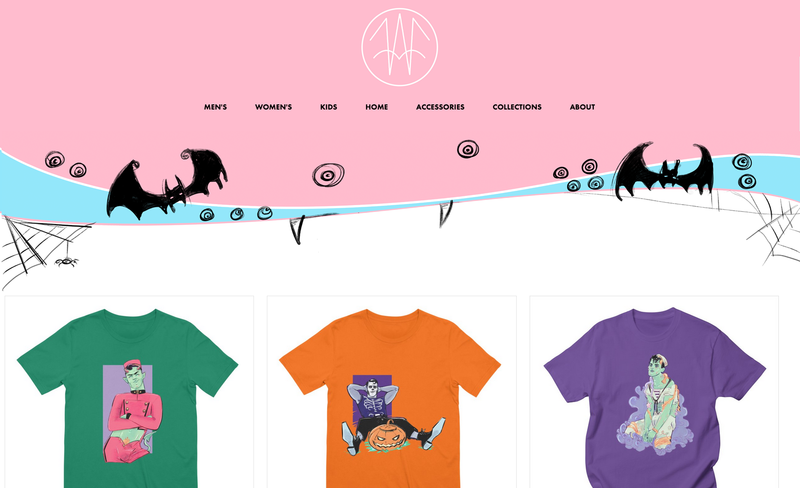 For example, Threadless worked with Foxtail and Moss on a gallery wall post using our prints. Just be sure that you’re working with someone who’s relevant to you and your designs. It won’t do you any good to connect with a fantasy football audience, for example, when your designs are all witchcraft-themed. Here’s a handy guide to refer to when reaching out! This year, we’re running free shipping in Artist Shops through 11/26 at 11:59 PM CT (aka Cyber Monday)! Be sure to tell people about this deal in addition to any promos you run. Free shipping is the cherry on top of any good promo! Facebook and Instagram ads: if you wanted to try dabbling in the world of paid ads, now’s a great time! Budget a little money to put towards running ads for your Shop. Here’s our guide. Get an email newsletter going: If you don’t have one already, leverage the emails you have from customers who have purchased from your Shop, fans, etc. and start up an email newsletter to spread the word about your promos, new products, and to send fun content. Find out how to build your list and how to run an email marketing campaign. I have used the leggings template in Photoshop, followed instructions. When I uploaded to my site I do not get the button to see the product. It is grayed out and there are no sizing buttons either. What am I doing wrong???? I really want to get some legging ordered…. Next post New Product Alert: Add Stickers to Your Artist Shop!